UMB’s program dedicated to the overall wellness of associates includes Wellness Coaches who help associates achieve individual health and wellness goals. The most recent addition to this program focuses on stress relief through meditation. The following blog post is authored by Will Malcolm, UMB Wellness Coach. Meditation is a practice to bring thought into the present moment. It helps you come to the present and change your perception on life. I think people meditate without realizing it. There are a lot of things we do during the day where we engage a ‘being in the zone’ mindset. 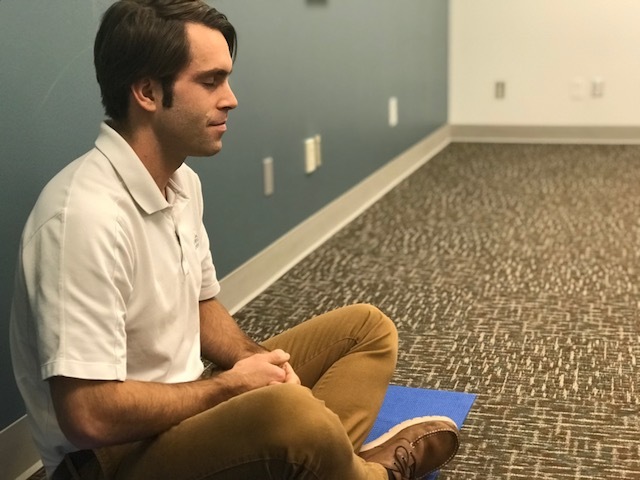 As part of our eight-week guided meditation program for UMB associates, we’re encouraging people to “take a time out” during their day to meditate. Our 10-minute sessions will cover a broad variety of meditation practices. About 99% of our participants are meditating for the first time, with one of our participants sharing they had no idea this is what meditation is or that it’s so powerful. Meditate with other people. This could be a yoga class, a guided meditation, Tai Chi, etc. There are apps and online resources for meditation, but if you’re just getting started, there’s something special about meditating in a group setting. You can build a community and build on each person’s positive energy. There are less distractions than when you’re meditating at home and simultaneously hear dogs barking, the phone rings, etc. Be open to the experience. There’s no right or wrong way to meditate. Don’t get caught up in whether you’re doing it right. Use meditation in situations where you need to check your perception. You might be perceiving a situation at work as negative. However, after you do some deep breathing or go for a walk, you perception might change. Discover what works for you. There are so many different types of meditation. It can be as basic as deep breathing or simply envisioning having a great day. Figure out what you enjoy and what you’re most likely to stick with; you’ll really see the benefits when you’re consistent. Set an achievable goal, such as meditating once a week for 10 minutes. The benefits of meditation are many and anyone can try it. I love that UMB is encouraging associates to take short breaks to meditate, knowing when you take good care of yourself, you’re a better associate. Learn more about UMB’s Associate Benefits and Career Opportunities. I’m so EXCITED and THRILLED to be a part of these sessions! Thank you for offering this to us! Great idea to a wonderful start to a NEW YEAR!! !